The Hukam today is by Guru Arjan Dev Sahib Ji in Raag Todee on Ang 711and 712 of Sri Guru Granth Sahib Ji. Dhan Guru Arjan Dev Ji Maharaj is speaking to us today. Satgur Ji begins in todee mehlaa 5 - in Todee Raag. Guru Sahib Ji, in this Raag, puts down two ways of living. Either you live in remembrance or you live in forgetfulness. Satgur Maharaj Ji says the path of remembrance is the path that gives you happiness. The path of remembrance is the path that gives you fulfillment. The path of remembrance is the path that brings you closer to the God or the Guru. The path of forgetfulness is the path of pain, it is a path of poison, it is a path of burning. And that is what Guru Ji says in the Hukamnama today. Those people who bisrat, those people who walk on the path of forgetfulness they bisrat, they forget Hari, Parmaatama, Waheguru, God. sadaa khu-aaree - forgetfulness, forever and forever it leads you to khu-aaree.khu-aaree can mean ruin, khu-aaree can mean wandering aimlessly, khu-aaree can mean being alone and supportless. When you forget Waheguru, Guru Arjan Dev Ji says don't think that by forgetting Waheguru, that path of forgetfulness will lead anywhere else other than ruin. Forgetting Waheguru will only lead us further and further away and down this path of ruin. Satgur Ji, Sachay Paadshah takes us from looking at this path of forgetfulness and shows us sadaa khu-aaree it always leads us to sadness, it always leads us to ruin. 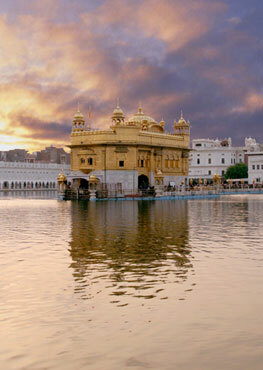 But on the other hand Guru Ji brings us back to the path of remembrance. jaa ka-o, that person who has, ot - support, which support? tuhaaree, Waheguru that person who has you to support them, O God, that person who is walking on the path of remembrance, who has your support in every part of their life then taa ka-o Dhokhaa kahaa bi-aapai how can Dhokhaa, how can they be deceived? Dhokhaa means deception; kahaa means how. Guruji is asking this rhetorical question from us, in order to ask ourselves- O my mind there are two paths; one is leading to ruin and the other is where you are always supported, where you cannot be deceived. And if we look, why this person cannot be deceived, Guru Granth Sahib Ji tells us na Oh marai na Thagay jaheh Jinkay Raam Vasai Mann mahai Those people who have Waheguru in their mind, in their heart and soul they cannot die or be deceived. The greatest deception in this world is Mai-aa/Maya. These things in this world that look like glitter like gold but when you touch them they are like glass, they break into pieces. These alup sukh - little tiny pieces ofsukh - happiness, remain only for small amount of time before they turn into sadness. That person who remembers God lives in this world but remembers that the joys of this world are transitory; doesn't get deceived, does not lose him or herself in them. rahaa-o Guru Ji says pause and think about this. Do you want to lose yourself in them or do you want to catch on the remembrance of the Almighty. Only those who gaa-ay sing the gun - praises of Waheguru; niDhaan means treasure. Only those people who sing the praises of Waheguru, who is the treasure of all praise, the treasure of all virtue- jaa ka-o kirpaa Dhaaree who have Wahegur Ji'skirpaa, Waheguru Ji's grace. O human being if you are sitting in the Gurdwara Sahib now, repeating the name of God, that is the grace of God working within you. If you are listening to daily Hukamnama that is the grace of God working inside you. If you are listening to Kirtan in the car that is grace of God. tin hee gaa-ay jaa ka-o kirpaa Dhaaree Only those people can sing his praises, can sing Waheguru's praises who can connect to the Almighty AkalPurakh Waheguru, the source of all joy. Only those can connect to the source ,that Waheguru Ji, who have Waheguru Ji's grace. Maharaj Ji says that person who immerses himself or herself on the path of remembrance of God so sukjee-aa only that person is happy in this world.Dhan us janmaa, Guru Arjan Dev Ji Maharaj says blessed is that person's life, naanak tis balihaaree if you ask me, Guru Arjan Dev Ji says I am ready to sacrifice to that person. Walking on the path of forgetfulness there is poison, there is ruin, there is defeat; walking onn the path of remembrance, there is happiness, there are blessings. On the path of remembrance even the Guru is ready to sacrifice for that person who walks on the path of remembrance.